Are you living like an orphan or an adopted child of God? The gospel of Jesus Christ doesn’t simply reconcile us vertically to God but also reconciles us horizontally to one another. In this book Russell Moore invites you into a conversation about adoption between both God and us, and with us and children who are in need of a family. I believe more firmly now than before that adoption forms a “real” family and that our adoption in Christ means the church is a family made up of all adopted sons and daughters of God. As Christians we should care about the things that God cares about which is people. And if Christians did not adopt, do foster-care, help single parents, or care of orphans then we would be hypocrites to be only known as being pro-life. We should be caring for human life at all stages and care for individuals as Christ would. The mission to share the love of Jesus includes caring for those around us. Too often we think of missionaries as those off in a far away country serving the Lord, but each of us are missionaries too and even more so if we are looking out for children around us from other countries. 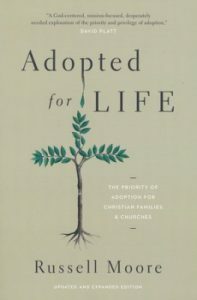 Once you read this book you’ll never view adoption the same again and that’s why I highly recommend and encourage you to learn more through reading this book. This month we are sharing Our Core Values. We believe these values are very important to be servant leaders and hope it will remind you of God’s desire for His Church. Our responsibility is simply to seek the Lord, rely on His Spirit, and obey Him. God calls and empowers us for ministry. Our responsibility is to worship Jesus with our whole life surrendered unto Him. Singing is EASY, Surrender is HARD. Our responsibility is to love and care for others. We don’t pretend to have all the answers but love God and love everyone created in God’s image, and maintain healthy boundaries in our relationships. Our responsibility is to promote the spiritual welfare of His sheep (Christians) and healthy sheep will automatically and naturally reproduce healthy sheep. Our responsibility is to emphasize the grace of God and what He has already done for us: Jesus loves us, died for us, lives to prays for us, forgives us, and is always with us to help and guide us. Our responsibility is motivated by our love for God and for people. We are honest and are called to bless others because we never outgrow serving. Our responsibility is to ‘Simply teaching the Bible Simply’ in a loving and relaxed way helping people learn how to apply the Bible from its context. We will not compromise living in obedience to the Bible. Our responsibility is to be good managers and careful with every penny of God’s money and resources with great integrity. We know where God guides, He provides because He owns it all. Our responsibility is not to build our own ministry or criticize another man’s servant, and we cooperate with like-minded churches. Jesus will build His church and the authority of God’s Word will last forever. He alone gets the glory. Our responsibility is to be flexible, willing to go wherever the Lord leads as God equips the called. We live from the Gospel and are faithful unto the Lord. Blessed are the flexible for they shall not be broken.